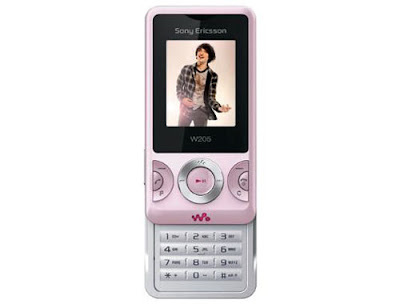 Here comes the latest addition to the Sony Ericcson’s popular music phone series W205i. The launch of the Sony Ericsson W205i in India is expected to be in a few months in India. There are many rumors about the price. Most of them are around 3,000 to 5,000 Indian rupees. 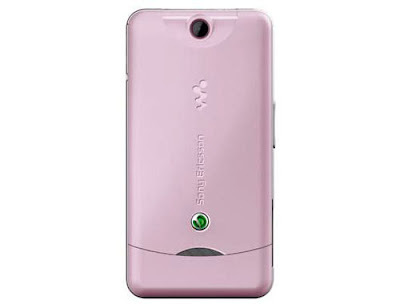 Sony Ericsson W205i is Java MIDP 2.0 enabled and supports 2G network in the frequency range of dual band GSM 900/1800 MHz. There is 1.8 inches TFT screen with 65k colors. The screen resolution is 128x 160 pixels. The integrated camera with flash light is of 1.3 mega pixel. It has an image resolution of 1280x 1024 pixels. Video recorder is also present. The phone has GPRS and EDGE supporting the connectivity. GPRS is of Class 10 (4+1/3+2 slots) with a speed of 32 to 48 kbps and EDGE is of class 10 with a speed of 236.8 kbps. There is a WAP browser and HTML (Opera Mini) browser for fast and easy internet browsing. 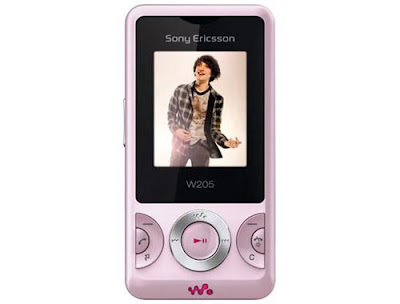 Needless to say, the phone is equipped with the walkman media player with a TrackID music recognition which is the main attraction of the Sony Ericsson W205i. The phone supports MP3 and AAC music formats. There is a video player also. There is a stereo FM radio with RDS in the phone. It has an in built speaker. The internal memory available is rather small and 5MB in size. But there is an external Micro M2 card slot which can support up to 2GB. The phone book can store up to 1000 contacts and photo call facility is also present in the phone. The call log will store up to thirty dialed, received and missed calls. The phone is powered by a standard Lithium-Iron battery which will provide a talk time up to nine hours and a stand by time up to 425 hours. The music play can go continuously up to 13 hours and thirty minutes. The dimensions of the phone are 92.0 x 47.0 x 16.4 mm and it weighs around 96 Gms. There is global positioning system present in the phone. The messaging facilities include SMS, MMS and instant messaging. The wireless connectivity is made possible through Bluetooth v.2 and there is USB 2.0 port in the Sony Ericsson W205i. In built games are present in the phone and the facility to download more games from the internet is also there. W205i supports polyphonic, MP3 and AAC ring tones and also has internal vibration alert. Then the additional features of the phone include organizer, memo etc. The phone is available in ambient black color in the market.